Those who have followed my career know that I used to be a professional content curator on top of my work as a social media instructor. Then, photography took over and I have since limited my activity in those fields. 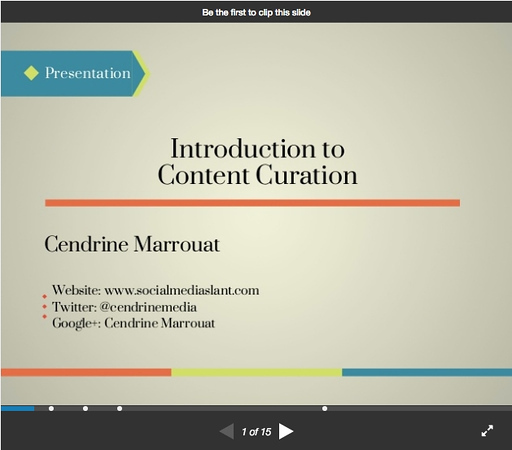 About four years ago, I was asked to introduce content curation to a group of local business owners. It was a great opportunity for me to help people understand what it could do for their businesses. Content curation is not a uniform practice. There are as many ways to do it as there are curators. And that's why it evades many. Curation does not have to be about words on a page. It can also be as simple as putting together a collection of user-generated content that helps deliver an important message to your audience. Spend some time with an art curator and see what they tell you about their work. Just like beauty, context is in the eye of the beholder. Curation goes beyond redirecting people to useful posts and (yes!) competition. It also helps make sense of a social web that has become too noisy and overwhelming. Why am I saying all this? Because earlier this week, I came across an article ("The Confounding Practice Of Content Curation") in which the author tries to debunk the value of curation. Those who know me are aware that I welcome contrarian views with open arms, especially if they encourage positive conversations. After all, my experience and thoughts are not the only valid ones. I also understand that some people and companies may not be interested in curating content. However, the article has the potential to be very misleading to the people and businesses that curation can help most. So, I felt compelled to respond to each argument individually. First argument: Content marketers worship curation as the only viable alternative to creation. We apparently don't understand that social media can also be used for other things, like interacting, listening, and engaging with others. According to the author: "I’ve done my share of curating, and I’ve hated every moment of it. Forcing myself to sift through endless junk in search of that one gem was pure torture. I’d rather create something on my own any day." Yes, curation is hard and time-consuming. Nobody has ever denied it. But isn't creation the same thing? When I find and share a gem, that I get a comment from someone, a door opens. I grab the handle and reach out to them. They respond. We have a short conversation. They add me on Twitter or Google+ or look at my website. They will often share my content and I will do the same if it's relevant to my audience. And the conversation continues. Second argument: You will never become a trustworthy source or thought leader with curation. You are just wasting your time sending people to the competition. "Being your resource is not my job. Being someone else’s resource is not your job. If that’s the goal of your curation strategy then ask yourself how much you’re getting paid to spend hours researching and aggregating content for “your audience”, who, let’s be honest, is probably comprised of many thousands of people you don’t even know." Apparently, creating content does not require any research, curation, or aggregation. Our posts, infographics, and videos appear out of thin air. If being the resource of our audience is not our job, what is our job then? Third argument: Content curators are like RSS feeds. "If you really want to give your customers what they need then figure out what that is and give it to them. Write the blog post they need to read. Answer the questions they need to understand. Do that and you’ll be far ahead of the curating herd." Adding more noise and constantly sharing content from the same source are not the solution. Customers want us to stop treating them like numbers on a list. They want us to care, and deeply. People do NOT have to read OUR blog posts. We can always recommend helpful content but, at the end of the day, they get to decide what they want to do. Fourth argument: The author is scared for her clients. She doesn't want them to send people to "look for that authority elsewhere." So, that begs the following question: Why do people read our posts? If they already enjoy them, the answer is easy. They will not need much convincing to click. However, if they don't know us, it will take a little more work. They will look at a title first. If it strikes their fancy, they will click. What's next? Skimming. Reading really happens afterwards. I visited the author's Facebook Page to see how she shares her own content. She doesn't just drop links and leave. She actually explains what her posts are about. She shares her two cents. She even asks questions. That's because she wants people to click. In a nutshell, she actually curates her posts. Fifth argument: Sharing content from her Triberr mates all day is not curation. She doesn't want to look authoritative or win a medal. She promotes these people because they are "worthy allies" and write valuable content. She also thinks they deserve more visibility. It's a "relationship building strategy that works because I’ve witnessed it working." It is exactly why I and countless others are curators. "Sharing is done out of loyalty, appreciation, cross promotion, relationship building. I share because I want to. Not because I’ve made some weird assumption that “my audience” wants me to. I share because I believe that what I’m sharing should be seen, read, heard and listened to farther and wider and I’m glad to be part of that chain." Once again, it is exactly what curators do. So, I am not really sure of the difference between what we both do. Seventh argument: It didn't work for her. She spent 18 months in hell trying it on her blog. She saw no result in terms of traffic, lead, or sale. So, no one should do it. I can understand her frustration. After all, it took me almost four years and a lot of work outside my blog to be recognized as a curator. It didn't come by snapping my fingers. As a curator, I have never focused on leads and sales. I have never counted the number of thanks, comments, and visits. Instead, monitoring conversations has allowed me to engage with people where it is convenient for them. I have acknowledged them in as many ways as possible -- and not just the big influencers. All my successful peers have done the same thing. Last argument: Real brands don’t curate. And that includes Coca Cola, Whole Foods, and Starbucks. Starbucks does too! Check it out here. Actually, she makes a valid argument. Big brands don't really curate. But there is a simple reason for it: They do not have to. They were in business and had customers before jumping on the social media bandwagon. Following them on social networks was a natural thing to do for their audiences. So, unless they make a huge mistake, those brands don't really have to woo customers. But we, small business owners and entrepreneurs, DO. And actually, it is a good thing. We can build great relationships with our readers and customers in a unique way. We don't need more content. What we need, though, is more brands run by people willing to share the space and keep their egos in check. There is room for everyone.